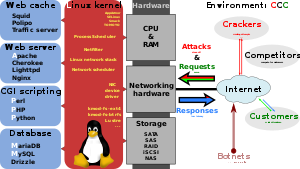 ^ "What is web server?'". webdevelopersnotes. 2010-11-23. Retrieved 2019-02-01. ^ Zolfagharifard, Ellie (2018-11-24). "'Father of the web' Sir Tim Berners-Lee on his plan to fight fake news". The Telegraph. ISSN 0307-1235. Retrieved 2019-02-01. 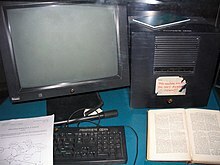 ^ "History of Computers and Computing, Internet, Birth, The World Wide Web of Tim Berners-Lee". history-computer.com. Retrieved 2019-02-01. ^ Macaulay, Tom. 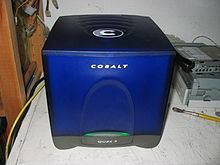 "What are the best open source web servers?". ComputerworldUK. Retrieved 2019-02-01. ^ Fisher, Tim; Lifewire. "Getting a 502 Bad Gateway Error? Here's What to Do". Lifewire. Retrieved 2019-02-01. ^ Fisher, Tim; Lifewire. "Getting a 503 Service Unavailable Error? Here's What to Do". Lifewire. Retrieved 2019-02-01. ^ "What is a 502 bad gateway and how do you fix it?". IT PRO. Retrieved 2019-02-01. ^ Handbook of digital forensics and investigation. Casey, Eoghan., Altheide, Cory. Burlington, Mass. : Academic Press. 2010. p. 451. ISBN 9780080921471. OCLC 649907705. ^ Vaughan-Nichols, Steven J. 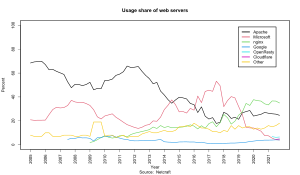 "Apache and IIS' Web server rival NGINX is growing fast". ZDNet. Retrieved 2019-02-01.